St Lawrence Islanders pose with two sailors in white caps in front of a “Chuckchi style” house. ASL-P01-3198, Alaska State Library Photograph Collection, Alaska State Library-Historical Collections. This blog contains original articles and photos pertaining to Alaska, the Yukon Territory, Northwest Territories and northern British Columbia. The focus is travel information and history. Photography, both historic and current, is an important aspect of their interpretation of both of those subjects. It also contains community and highway guides. This website provides a list of publications written about a variety of basic Alaska historical topics. By searching this site, you can find other history material from the State of Alaska. 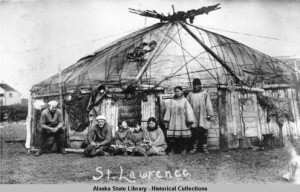 The Arctic Studies Center in Anchorage, Alaska features items that represent the cultural heritage of Alaska’s diverse Native peoples, and makes these resources accessible to Alaskan scholars, artists, educators, students and the general public. Native peoples, scholars and museum associates work together on a broad range of collaborative research, exhibitions and education programs. They also offer lectures, workshops and courses in cultural research and museum skills.